Vail’s Tess Johnson climbed onto her first World Cup singles mogul podium on Friday, finishing third in the season-opening event in Ruka, Finland. While Johnson, 18, has won in the World Cup dual event and had five top-10 finishes in singles last season, she had never been top 3. Johnson qualified for the 2018 Pyeongchang, South Korea, Winter Olympics last season with a fourth-place finish in singles, and wound up 12th at the Games. The singles event is the medal event at the Winter Olympics; the dual, side-by-side event is not a medal sport at the Games. 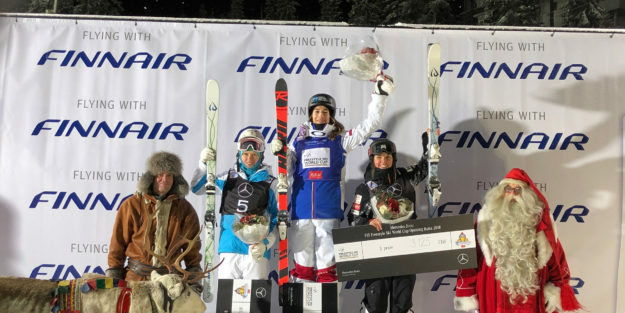 Tess Johnson (Vail, Colo.) took third in Friday’s first FIS Freestyle World Cup moguls event of the 2018-19 season in Ruka, Finland. She shared the podium with France’s Perrine Laffont, who came in first, and Kazakhstan’s Yulia Galysheva in second. The event was structured in the Olympic format, with two qualifying rounds and two finals rounds for the men and women. The U.S. had five athletes qualify for finals: Johnson, Jaelin Kauf (Alta, Wyo. ), Olivia Giaccio (Redding, Conn.) and Alex Jenson (Park City, Utah) for the women and Casey Andringa (Boulder, Colo.) for the men. Kauf, the fastest female moguls skier in the world, moved on to the super final, finishing in fifth. Giaccio, who currently performs the hardest run on the World Cup circuit for women, pushed it really hard to the end and finished 12th. Jenson, who skis with Park City Ski and Snowboard Club, returned to the World Cup due to injuries on the U.S. Team, really took advantage of the opportunity she had and finished 13th. Andringa, the top male finisher for the men, landed in ninth but will be a force to watch this season. The rookie men – Jesse Andringa, Hunter Bailey, Jack Kariotis, Dylan Walczyk and Emerson Smith – made a lot of good steps in their learning process today in competing at the World Cup level. These athletes will only continue to improve and we should expect them to climb higher as the season progresses. The U.S. Moguls Team heads to Thaiwoo, China, where they will compete in moguls and dual moguls on December 15-16.